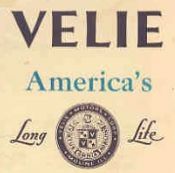 the Velie Motor company in Moline ILL.The Velie Car Co. became a leader in quality, not size. Today the Velie is remembered only by automobile buffs, but in its day it was prized for its combination of quality and low price. For the first six years the Velies were advertised in the John Deere catalogue.Velies were made from 1908 to 1928.Willard Velie died on Oct.24, 1928. His son closed the Velie factory in Nov. he said "that he could not run the Velie plant and the aircraft plant, at the same time". There are 194 owners and their 221 vehicles world wide. 180 cars running/restored condition and 41 parts cars. We list 8 trucks in the Velie Register.Velies are located all over the world USA, South Africa, Sweden, Germany, Denmark, Finland, South America, NewZealand, Australia,Norway,and Canada. Williard L. Velie wanted to do the same thing as some others. He had seen his first automobile in 1901 when a minstrel show came to town. He could afford the capital to start production, as his mother was the daughter of John Deere (who had made a fortune in the production of agricultural equipment, especially the steel plow). Willard Velie Helped run the JOHN DEERE plant with members of the Deere family.Before Willard Velie made his autos, he manufactured Buggies and wagons from 1902 to 1909.Willard Velie had a ranch near HIGHWOOD Montana he would spend the summers at the ranch. 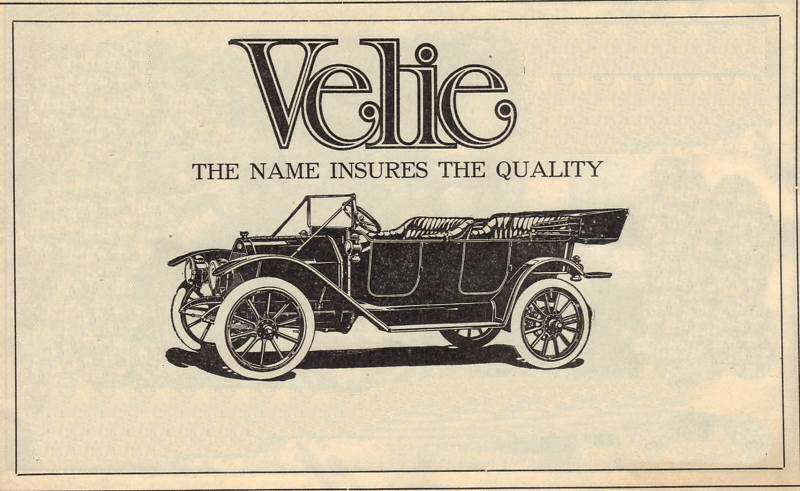 The Velie Motor Vehicle Co. was incorporated in 1908. 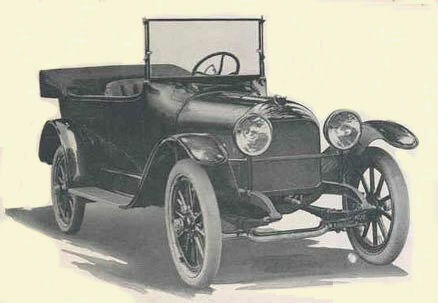 The first Velie car was taken to automobile shows. It had a four-cylinder engine, and the car was sturdily built. The car was immediately successful. This Car is alive and well and is living in Red Cloud NE. One thousand cars were sold in 1909, the first year of production. Another type of four-cylinder engine as sold in 1910.Velie developed its own four-cylinder engine in 1911.Initially, Velie cars were marketed and sold through John Deere dealers. Some Velie vehicles participated in car racing and were moderately successful.The Velie car finished 17th in the 1911 Indianapolis 500 race.Car production was a steady 3,500 units a year. Willard Velie built a 46-room, Jay Gatsby-type mansion in Moline, Ill., with proceeds from car sales. reorganized as Velie Motors Corp.
A production high of 9,000 cars were produced in 1920. Velie settled in the comfortable output of 5,000 cars a year. Since 1917, Velie car engines had been six-cylinder, which were refined in 1926.The factory in Moline reverted to Deere and Co.
Today, the family mansion, Villa Velie, is a bank building. A number of happy Velie owners in Louisiana named the town Velie. Thus, Velie, La., was born.After World War I ended in 1918, a Velie car won the race against other cars up Pikes Peak. The car was also competing well in the marketplace against other car makes.